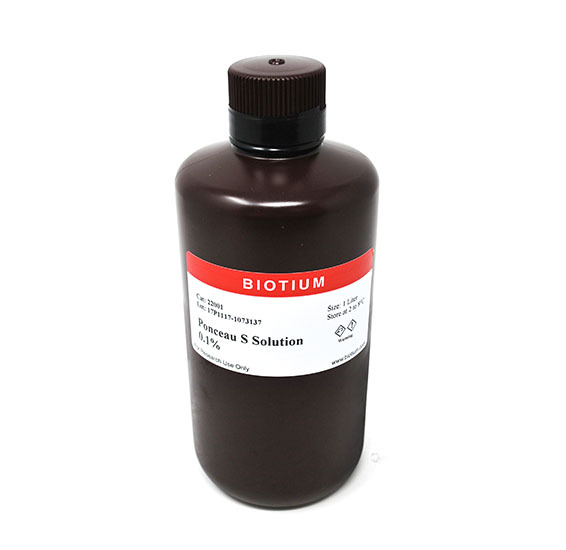 Ponceau S is used for the detection of proteins on PVDF and nitrocellulose membranes with a limit of detection of about 250 ng of transferred protein. The dye rapidly stains proteins on membranes pink or light red for easy visual inspection of protein transfer. The staining is reversible and compatible with subsequent Western blotting. Ponceau S Solution contains 0.1% Ponceau S (w/v) and 5% acetic acid.